Our workshop at WSED2019 - World Sustainable Energy Days, was held on 28th February at the European Energy Efficiency Conference, in Wels, Austria. Wim Boydens introduced the workshop as Chair and addressed both the state of the art of hybridGEOTABS technology and the future potentials in terms of results' exploitation. Presentations included topics on Heat pump design and markets, model predictive control, geothermal applications, design and value of hybridGEOTABS buildings. Our total number of attendees reached 11 external stakeholders, as well as the six speakers presenting the project, 17 total. The questions and answers have been added as FAQs providing more information on hybridGEOTABS buildings and the motivations of the project. I'm interested in the MPC controller process and how nowadays it can be effective on the outputs of the hybrid technologies? Lukas Ferkl (Energoklastr): The optimisations produced by MPC do not depend on the starting point of characterisation but, as Anke Uytterhoeven (KU Leuven) added, the important goal is to take into account the most amount of predictions and anticipations that are involved in the technology development process. Do MPC predictions take into account inhabitants' behaviour as an indicator? Lukas Ferkl: This is not a needed indicator, but if it is taken as a parameter it will for sure improve the quality of the predictions because the more information is gathered, the best outcomes are reached when it comes to behavioral anticipations. Are family households taken into consideration for this project and how many individuals are keen to provide behavioral data? Lukas Ferkl: Considering family households lots of data are needed, so, at the moment, public buildings such as school and offices are more predictable in terms of energy behaviours because we already know what are the daily activities involved and how they are interconnected to the building itself. Is the problem about individual's behavioural data collection related to the involvement of volunteers that are able to participate on predictions? Anke Uytterhoeven: The development of an MPC controller has got better potential rather than giving to individual's freedom to react to the behaviour of the system. Do saving costs on energy efficiency have to take into account the individual's issues as well? Lukas Ferkl: There are already examples where the electricity network can save costs making households pay just for the energy consumed from the city grid and not pay for the one produced locally. SEB attendee: Sadly, in Austria this is still not possible. How could the building envelope energy storage combine the thermal comfort using a MPC controller to have a temperature adjustment not just reacting in the present, but also predicting a future adjustment? Wim Boydens: The envelope has a system of pipes that is being heated while the MPC can predict the temperature overnight or during the day for the next 6-8 hours. Is it possible with the hybridGEOTABS system to have different comfort levels in different rooms of the building? Wim Boydens: TABS controls set a profile-controlled temperature that does not change among different zones. 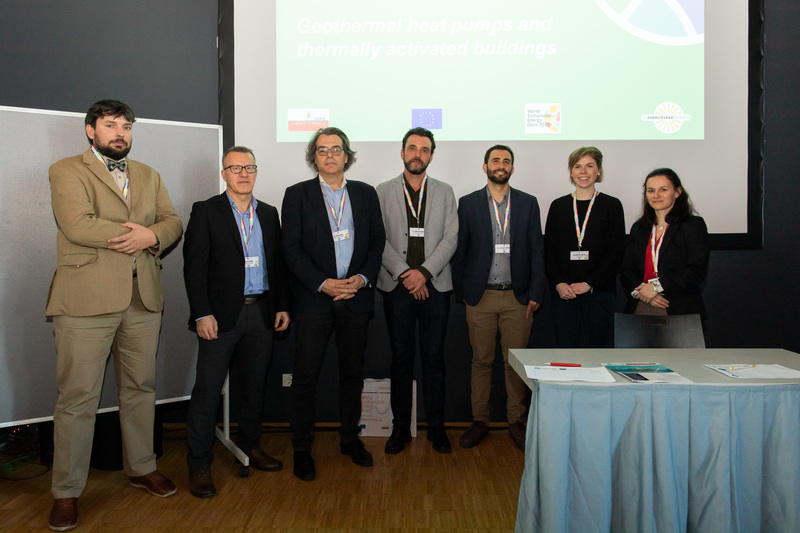 For the combined heat pumps systems, and the new technologies related to them, it is needed a high level of expertise and, at the same time, we need companies that are able to provide specific technologies. So, how is hybridGEOTABS going to assure a good quality of these outcomes? Gert Dewandeleer (Nathan): The key point is to train the installers to a high level of expertise. Wim Boydens added that on the control side as well there is still lots of work to do and it constitutes a big challenge. SEB attendee agreed that on the heat pump installation side, the training is a very important issue and in her company there is already a program developed for trainings/installations. In my company we are also dealing with TABS buildings, but they do not constitute a scalable technology if there are no experienced people that can fill the gap between the novelty and the technology itself. Anne Caminade (Lemon Consult): Usually a tendering document is based on a collection of data that is used to develop the project, letting the installers be aware on how to work with the systems involved. Also, students can be included in training programmes as well, and in any case there is always a quality assurance assessment for every project launched. Wim Boydens noted there is also the plan to start a training body that is not focused just on the heating pumps installation, but on their integrations with other systems. Gert Dewandeleer added that from the manufacturers side there is already the possibility for the installer to actually visit the installation site checking whether or not the heat pump was installed correctly. Who are the potential customers of the project? Wim Boydens: At the moment the project outputs are being tested on 4No. case study buildings where elderly houses and schools are included. SEB attendee: Company customers are willing to follow a new approach but then, on a practical side, we can see that there is a lack of courage when it comes for example to public buildings (using an example about a public building in Austria that could have been a good starting point to invest in new energy systems, but it then resulted in a weak designed construction). Another example in Salzburg, was how inhabitants are slowly moving outside the city, in the suburbs, to build single family houses and the key problem is that construction companies still don’t know that they can already use new technologies. In addition to this, the company already has a team working on building services, and the Austrian regulation schemes require different indicators combinations not only focused on energy efficiency, but also on primary energy consumption. Another issue is that the technology focuses on single buildings, while it should be focused on a district. Lukas Ferkl: An example related to a district in Netherlands shows good results and it is working fine even if the starting investment was high. Plus there is also another call within the H2020 projects to be exploited concerning energy districts. Does hybridGEOTABS also considers the retrofit of existing houses? Wim Boydens: There are already tests on the ceiling effects and the face-change materials. Anne Caminade then gave a short introduction to face-change materials. Regarding the installation of heat pumps, in Salzburg there are many cases where there is no possibility for the installers to drill (geodetic local regulations issues). Wim Boydens: This also happens in Luxembourg, where there is no possibility to drill as there is an underground layer of drinkable water. In countries where there are no rules on geodetic regulations it is better to not rush the technology. The discussion ended with Wim Boydens addressing the potentials of hybridGEOTABS and how nowadays people are of course attracted by new technology advantages, but in order to have a market uptake it also needed a life-cycle analysis otherwise, and SEBs agreed, companies will not invest on them. The feedback about the whole WSED event was excellent – more than 660 experts from 60 countries participated in the 3 conference days of the World Sustainable Energy Days. Model Predictive Control (MPC) for “hybridGEOTABS"